time: about 10 minutes prep/cleanup and 15 minutes to bake. Distribute muffin holders into the muffin pan (or pans!) Drop bread into bottom of said cups, evenly-ish. Mix egg, milk, and salt and pepper if desired together, and pour evenly into each cup. Sprinkle even amounts of your meat and your cheese onto your egg mixture. Bake for 15 minutes or until eggs are set. Enjoy! So while the way the van is set up now works, I have great ideas for how it could work BETTER. LOL. I have been spending loads of fun time rearranging the van in my head, but this rearranging would mean stripping the whole thing out and moving most, if not all, the internal workings. BUUUUT…it would mean I could have a curtained-off sleeping area, the kids would have more floor, we’d have a TABLE!!! and more storage behind drawers and not just sitting out on shelves. Wouldn’t it be wonderful if we could pick money off of trees? I would have it done this weekend, lol. 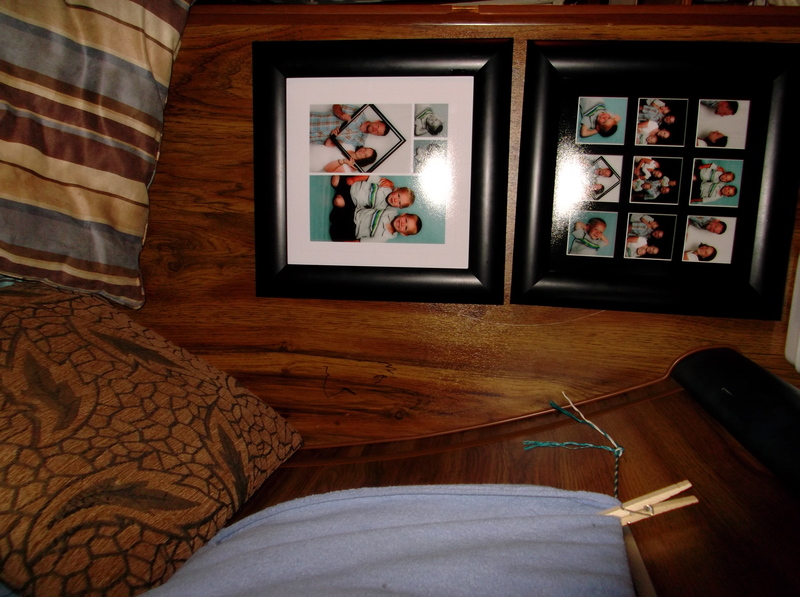 I have ALWAYS wanted to have framed photos hanging up of our family. I love taking pictures, and have some decent pictures in different places of the kids and such, but never got them printed off, never had frames, whatever. Early this summer we went in as a family to Walmart and had our pictures done. I was happy for the most part, but will never do it again if I have the choice. I didn’t get all the pakage pieces that I paid for (I am sure they would have at least attempted to right this had I complained, but I am not a complainer) and I ended up having to stress over payments for MONTHS. I am not a payment person. I like to buy something, or not. Anyways, in our package, we got two framed collages, among other things. The piece that was missing was sadly the part I wanted most, the CD…but clearly it wasn’t that big of a deal for me. And I LOVE the collages. So here is my new wall. 🙂 I love this so much it is ridiculous, and while I was afraid of them getting constantly knocked down, so far I have not had a problem. I get to enjoy the lovely photos and the awkwardly blank wall has something nice on it. 😀 And I know the kids will adore it! So I made this potholder (two of them!) based off of a potholder my mom had when I was a kid, that (I believe) a great grandmother had made. I was young, just starting to crochet, and was facsinated by it…it was cotton, two layers, round, and orange, lol. I remember it so well. I couldn’t figure it out back then, but this month I bought a roll of cotton yarn. 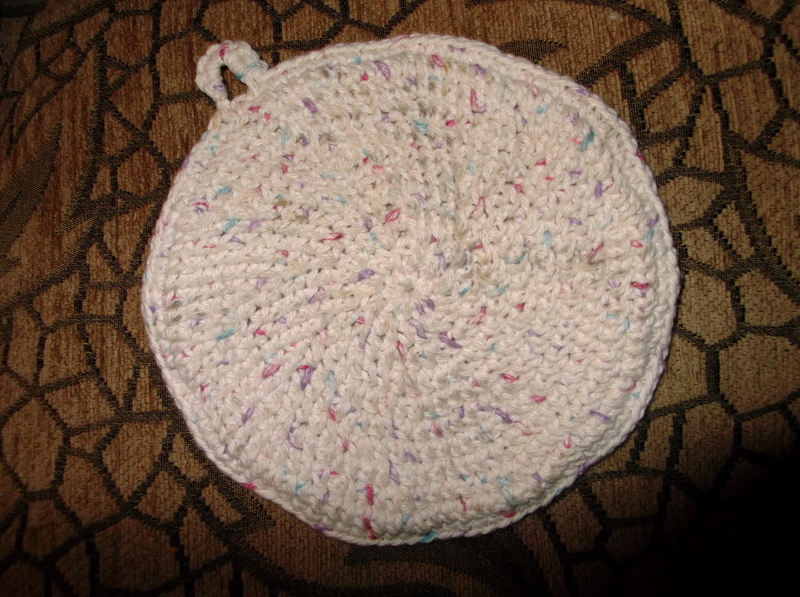 I needed a couple potholders adn some kitchen rags, and although I could have gotten them very cheaply, this only cost $5 and gave me a fun weekend project. Oh, and they all match, which is super cool in my book! Anyways, I am sure others probably have made the exact same potholders, mine is really not unique…but I made it off the top of my head, and it turned out well, and so I thought I’d give it a name and post it here. 😀 My apologies if you have done the same in the past, I promise I didn’t steal the pattern! So….make a magic circle! (Google it if you don’t know what I am talking about…they are awesome and I love them!) and make one st.
You have to make two of these. I made one super tight in stitches and one looser, just to see which I liked better. I do like the tighter one more, but they are both perfectly functional. Once you get both rounds made up, sc in each hdc around to join the two together. At the end I made a few stitches to make a loop and put a bunch of sc in there, too…so I could hang them if I wanted. So I spent a couple weeks at a couple different places. I spent a week-ish at a farm, and ended up leaving because the guy who ran the place and I had different ideas of what “rent” meant. When it became clear to him that we had not moved there so I could have an extramarital affair with him, he told me I would have to move on. LOL. I was happy to comply. After that, I spent around a week at a local Winco. THAT was fun! I loved having stores right there for me to browse in. 😀 There was the biggest Dollar Tree I have ever seen, and of course Winco, which meant a wonderful, cheap source of food and entertainment, and a variety of other stores to walk through. Of course, it was also rainy and cold and I had bronchitis (like the rest of everyone in the area, lol) so I didn’t get out as much as I would have liked to, but it was nice. 😀 No one bothered us, and I had my nice little propane furnace and an oven and stove, and my late Gramma’s big fluffy down comforter that she gave us before she passed away. Then some sleight of hand was pulled and I am back where I was originally, LOL. Which is nice in some ways…I have electricity now, and internet access. Of course, I miss being right outside the store, and the weather has been nice, so it’s harder to remember that I don’t like the rain, hahaha. I have to say, this is my easiest pregnancy so far. I have gained a little more than I would like to, but really within healthy range. No swelling at all, no dizzies, and all my morning sickness was over by around four months…way earlier than the others! The little ones are really impressed with how big the baby is getting, and say it will be as big as daddy when it is born. LOL I hope not! Just wanted to update y’all!